The Super Lemon Haze is the crazy unusual sativa plant that has been converting Indica lovers to the sativa loving side of the population. It is one extraordinary sativa that has been doing rounds on social media as a significant attraction for stoners and growers everywhere and indeed a lovable wee strain you can appreciate. Read our article on Sativa vs. Indica here! This strain can be reproduced by crossing a particular Lemon Skunk, and Super Silver Haze strains all of which are pedigree strains. Super Lemon Haze is undoubtedly unique. This Cannabis Cup winner is a cross between Lemon Skunk and Super Silver Haze both of which are pedigree weed and a force to reckon with when it comes to delivering a euphoric high that generates endless fun. The strain is designed with a wide range of medical benefits for a long list of ailments for which it can provide instant relief. Click here to view our Lemon Skunk products! 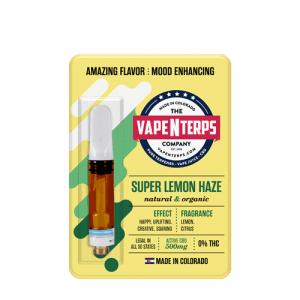 500mg Super Lemon Haze CBD Cartridge for $34.99! One word that best summarizes the impacts of Super Lemon Haze is energy. It’s all about the surge in power that causes positive vibes to flow without end. Don’t get it twisted, the Super Lemon Haze does get your relaxed and happy, but it also provides this balanced body and mind high and boosts cognition and productivity of muscle and brain. The Super Lemon Haze is a day time strain that is quite talented in making better use of your time regardless of your current situation. It can help your work through a project all night or make your day more fruitful. Whichever the case, you will find it harder to lay down and sleep on this bud and therefore you should not consider it for your bedtime dose of marijuana. This pot makes you super excited and happy and is the go-to solution for your lowest as well as those times when you want to get more work done. Effects are those of euphoria and energy typical of sativa strains, and the gradient of your ascent is quite steep such that you get high almost instantaneously unlike some other buds which rise rapidly and also subside just as quickly. The Super Lemon Haze is also called the frisky sweet talking bud because of its talkative and social effects. When you smoke this stuff, you want to hug everyone you see as you feel uplifted and overly friendly. This is no joke and should not go anywhere near your cubicle at work as it will significantly expose your stone to work ethics. For novices, stay away from this if you have some important events to attend. The stable cranial high tends to boost memory in addition to cognition. It will let you remember much of what you think and do when you sober up, unlike most other strains. It is the perfect bud to get high on ahead of a romantic night out as it will make you more prepped for romance and generally more social than your usual self. Throw in some sweet memories that stick, and you have yourself a deal. The Super Lemon Haze is a beautiful fragrant plant with the smell of earthy and sweet lemon drops and candy. When you encounter this strain several times, then it is easier to lean the smell by heart as it possesses a unique spicy and tangy presence. It has the best fresh smell of marijuana reminiscent of citrus fruits which make the strain quite the sweet charmer straight from the jar. The hints of earth and tangy lemon notes hit you smell cells like a train of sweet, unbelievable aromas doing ninety miles an hour and in an instance changes your life. The super lemon haze experience quite the thriller and one that will entirely late your definition of good weed and make you fall in love with the sativa way of things even if you are in love with the sedative seduction of the indicas. The smell of the Super Lemon Haze goes a long way to introduce the great taste of the product when you smoke. It offers a wild sensation with refreshing fruity flavor with a lemon earthiness that you will not find with that same intensity on any other plant on the planet. It is a masterpiece in every sense of the word and also a cocktail of interesting tastes. 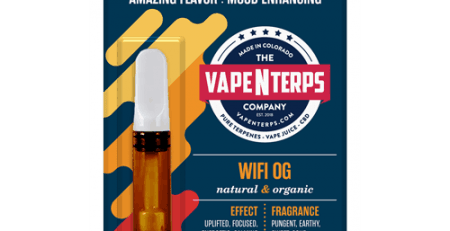 Every inhale feels like citrusy candy and the exhales comes with a lingering lemon tang that begs for another hit. It is super easy to smoke too much of the Super Lemon Haze without even knowing you are doing it. 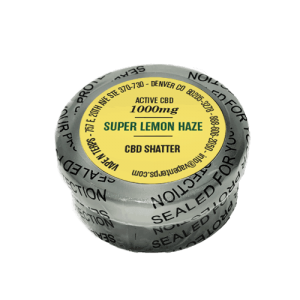 1000mg Super Lemon Haze CBD Shatter for $54.99! 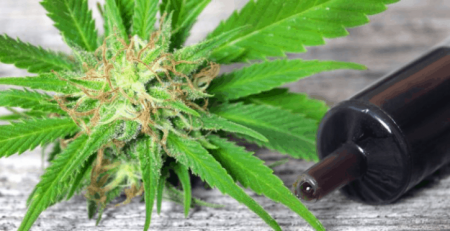 Often taking consecutive hits or even with regularly spaced hits, the strain may cause unwanted dizziness even though that is a less likely scenario. Nonetheless, it can happen and all the more reason to abstain from working with heavier machinery or driving under the influence of this or any other drug that alters the nervous system responses. Another effect of the sativa bud that might turn out to be a blessing for many and a curse for others is the insatiable appetite that it brings. You might put on quite some weight if you decide to munch on high-calorie snacks every time you get high. At the same time, people lacking the appetite to eat well and recover from illness and injury will significantly benefit from the munchies. The reason why this strain is recommendable for so many ailments and pains is that it gives you a cranial and well balanced and clear-headed high. 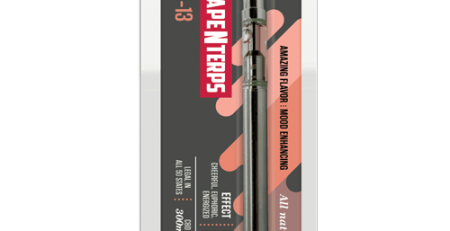 When taken in the right proportions as prescribed by your ganja doctor, the highly potent medicinal marijuana strain will eliminate stress and fatigue and restore energy while giving freedom from chronic pain and aches. The sativa ingredient gets you some positive vibes to run on and fuel a more productive day ahead. It increases your reward for getting things done and motivates to do more with your available time without getting weary. Stress and depression patients will benefit from the uplifting effects of the sativa element. Whether patients are suffering from high-stress life and schedule or they are living with full-blown depression due to loss, this strain is perfect for the alleviation of such symptoms and improvement of the quality of life and restoring happiness. Minor pains like joint pain and headaches are nothing a joint of Super Lemon Haze can’t solve. The bud is a winning solution for pain and the uplifting aroma, and uniquely great taste are all helpful in making your day better. Patients are increasingly finding this alternative medicine attractive because it does not have much of the adverse side effects of other manufactured drugs. The strain under our probe today happens to be an easy grow and one of the highest yielding varieties of weed you can grow at home for fun. The crop does well indoors and outdoors but has a preference for the indoor growing area where conditions are just right. It requires virtually no expert growing tricks and can be highly rewarding to grow for a novice. Judging by its low maintenance cost and attention plus the high yield, this crop is one of the most profitable ventures you can take up as a commercial grower. The strain is reasonably tolerant to diseases and will offer repulsion to mold and common garden pests. The strain makes an easy comeback from every rookie mistake a novice grower is likely to make and still yields well above average. Just be sure to get the right mold resistant seeds from a certified seeds supplier to avoid inconveniences. The beautiful Super Lemon Haze plant takes a good ten weeks to reach maturity even though some of the flowers may pop a week or two earlier. The crop will yield more on the indoors with an average of 28 ounces per unit area (one meter square) of growing space. In summary; the Super Lemon Haze is a fantastic social smoke that you absolutely should try for a lovely time and as an effective remedy for serious ailments as recommended by your doctor. When you want to grow this bud, jump right in if you have a knack for growing things. Do you have any experience with the Super Lemon Haze? Please do let us know what you think in the comments section below. Good luck.